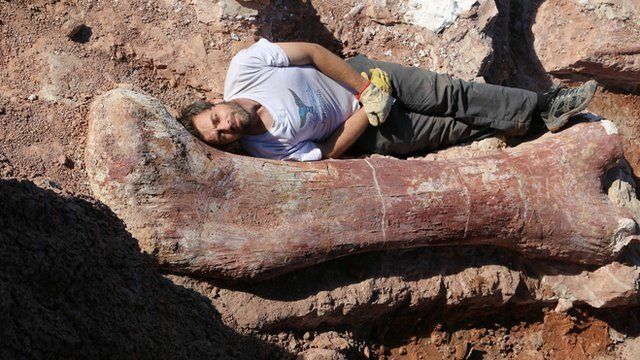 'Biggest dinosaur ever' discovered Jump to media player Fossilised bones of dinosaur believed to be the largest creature ever to walk the Earth has been unearthed in Argentina, palaeontologists say. 'World's heaviest' dinosaur discovered Jump to media player Palaeontologists in Argentina believe they have found bones belonging to the heaviest dinosaur to ever have walked the Earth - which had an estimated body mass of 77 tonnes. 'Pinocchio rex' discovered in China Jump to media player A new type of Tyrannosaur with a very long nose has been discovered by scientists in Scotland and China. How did dinosaurs support their weight? Jump to media player Researchers think they have found out how some of the largest dinosaurs to have walked on Earth managed to support their weight. Dinosaur chase scene reconstructed Jump to media player Scientists digitally reconstruct the scene of a dinosaur 110 million year-old dinosaur chase. New dinosaurs bring park up to date Jump to media player Life-size animatronics will bring dinosaurs to life at Isle of Wight's Dinosaur Land.